The fourteenth holding of The Sportsman’s Charity Golf Classic was played at Bruntsfield Links Golfing Society, Barnton Avenue, Edinburgh on Friday 6th September 2013. After a fairly good summer for golf, it was somewhat disappointing that the teams of four players had to endure rain for most of their rounds. The format was the usual texas scramble strokeplay with a “shotgun” start. Vino Wines, Edinburgh, and Harviestoun Brewery, Alva provided sustenance to the golfers at critical points. The team with the winning net score, receiving the traditional hickory maple headed putters supplied by St Andrews Golf Company, Largoward, St Andrews, was Team Valente, who held off a strong challenge from last year’s winners, The Royal Bank of Scotland, Commercial Banking, with Brewin Dolphin in third place. The winner of the longest drive, using a replica George Nichol brassie, being Walter Heggie of Campbell Smith, Solicitors and the winner of nearest the pin was Derek Blaike of The Royal Bank of Scotland team. An enjoyable dinner was held in the clubhouse after the golf and the players were treated to a Q&A session with Martin Dempster, Golf Correspondent of The Scotsman Publications. Martin, who also took part in the golf competition, answered all questions put to him thoughtfully and interestingly, bringing about a lot of discussion on a wide variety of golf matters. An end eventually had to be brought to this very successful session with plenty of people still wanting to ask questions. A raffle and brief golf orientated silent and main auctions were held resulting in the event raising a total of just over £4,000 for distribution by the Charity. 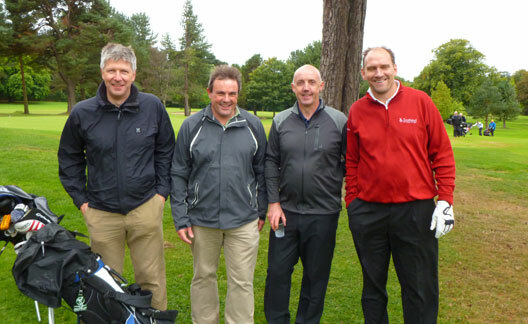 These funds will be donated to a golf orientated project to be agreed with the Scottish Golf Union within the fields within which the Charity operates, namely sport, children, the disabled and the disadvantaged. The support provided to the event by the teams, Bruntsfield Links Golfing Society, the volunteer helpers and all of those who donated some excellent auction and raffle prizes is very much appreciated by the Charity.